The jicama is a very popular vegetable in Mexico. It is normally eaten as if it was a fruit and the Mexicans love to see it in the famous salad in a glass – where chili powder, lime and salt is added. The jicama’s origin is Mesoamerican and it is full of nutritional properties. Thanks to the jicama this salsa is very fresh, juicy and in each bite you will feel the jicama’s crunchiness. What happens to be very interesting of the salsa is the contrast that it has because the coriander has a very different flavor to that of the jicama but the contrast that is generated is very harmonious . The jicama’s flavor and the coriander’s flavor complement very well. As good Mexican salsa more ingredients are used to give more joy to the preparation. The secondary ingredients help to increase the flavor of the whole salsa and they also season it in a special way. This salsa has another surprise because is very close of being a salad since all the ingredients are cut into small chunks (like in the pico de gallo ). When you finish preparing it can be enjoyed with your favorite snack, it can also be used to put to certain appetizers or it can even be put as garnish of some main courses. In this recipe you are only going to cut and mix... it definitely is very easy to make. When the jicama is bought pick one that has smooth peel because this indicates that is in good state. To make the salsa spearmint is used, which has to be fresh. In less than 10 minutes the salsa will be ready. Finely chop 1 serrano pepper, 1 spearmint sprig and 3 coriander sprigs. Upon completion put them in a bowl and reserve. If you want to reduce the hotness of the salsa remove the veins and the seeds of the serrano pepper. Dice the jicama that was peeled and 1/4 of a red onion; upon completion put them in the bowl. 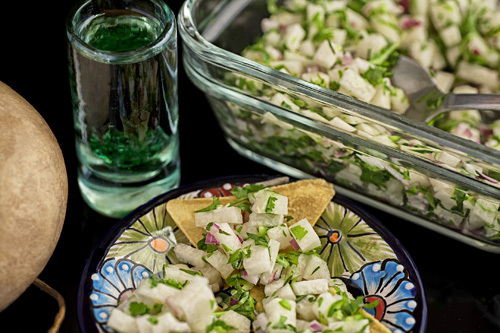 Mix very well the jicama and coriander salsa with a mixing spatula. Tip: If this salsa is left in the fridge for about 15 minutes before serving, it will acquire a more special flavor. Variation: The jicama can also be used to make a guacamole. Did you like the Jicama Salsa? A fresh and juicy jicama. It is easier to prepare the salsa with a lime squeezer. A mixing spatula that will serve you for many preparations.